Benign prostatic hyperplasia (BPH) is an enlarged prostate. 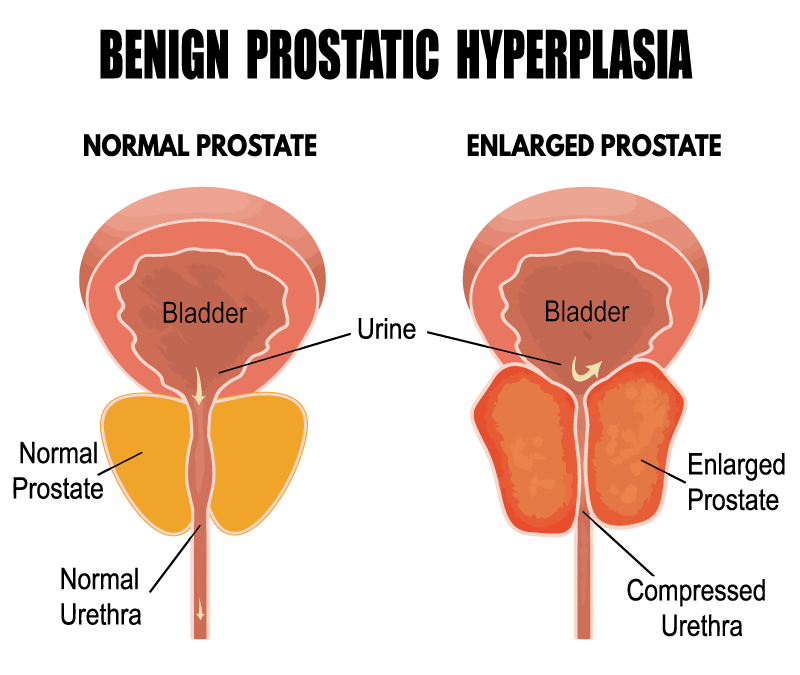 The first growth occurs early in puberty, when the prostate doubles in size. The second growth phase begins around age 25 and continues during most of a man’s life. BPH symptoms begin during this growth and can worsen with age. The prostate size, however, does not always determine symptom severity. Some men with large prostates can have minimal symptoms while some with smaller prostates may have severe symptoms. BPH can be associated with bothersome lower urinary tract symptoms (LUTS) that can interfere with normal activities and affect quality of life. Aging: Symptoms usually begin after age 40. About half of men between 50-60 have BPH and up to 90% of men over 80. Family history: You are more likely to have prostate symptoms if a blood relative, such as a grandfather, father or brother has BPH. The risk is increased if your relative had severe symptoms requiring treatment before the age of 60. Ethnic background: Asian men are less likely to have BPH than white and black men. Black men may experience symptoms at a younger age. Lifestyle: Obesity increases the risk of BPH. Exercise and a healthy diet can lower your risk. BPH evaluation and treatment are standardized across the nation and follow best practice guidelines. Using electronic care pathways, we ensure patients have access to the most up-to-date educational information. You may speak with a navigator on the phone whose job is to oversee your progress through the pathway and facilitate communication between you and your provider. The electronic BPH pathway maximizes patient education, compliance, and treatment success. This may be through behavioral modification, medications, testing or advanced therapies. The clinical pathway for BPH starts with the least invasive options involving behavioral changes, followed by a trial of medication. If no improvement, then testing and advanced treatments are offered.